By registering Email ID with your SBI Account, you can get your Account Statement directly on your email address and you can also be able to receive all ATM Transactions Alerts in your mail address. No need to visit every month for passbook printing. You can check the e-statement of your account in email address every month. For this, you can register online for e-Statement. To receive email statement first you need to register your email ID with your sbi account. 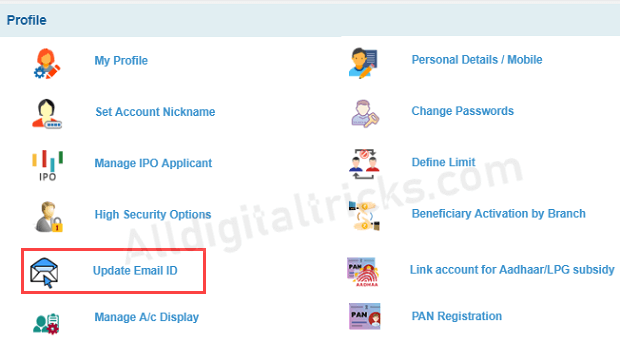 Let us see how to register or change email address with your SBI account. 3 After logging in, you have to click on My Accounts & Profile and then click on Profile. 4 In Profile, you have to click on Update Email ID. 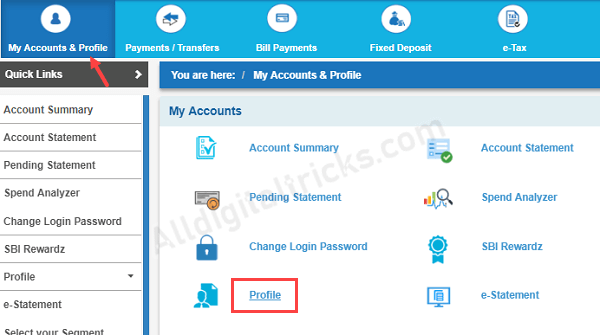 In the next screen, you have to type your Profile Password, if you have forgotten the profile password, read this: How to Reset SBI Net Banking Profile Password? 5 Now enter your email address in next screen. 6 In the next screen, you have to select the SMS (OTP) Approval option. You will receive OTP password on your registered mobile number, enter OTP in next screen. After entering OTP password, you have successfully register or update your email address for SBI Account. Now you can register for e-statement and also you will receive alerts for ATM transactions.